The warmly received premiere product of Trust MFG – the Catalyst liner, proved itself 100%, gaining lots of fans including myself so without any apprehension I picked up the ‘Spec Ops’. 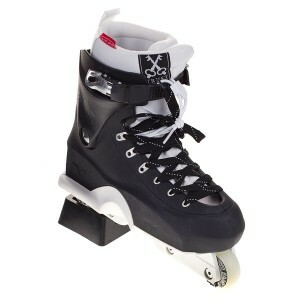 Thin, narrow liner which can be easily used with any narrow-shell skates like Valos or M12. After 2 months of tests I can share my opinions and basically answer the question: Do we really have an aftermarket liner that can be squeezed into Valos, without changing it’s natural and distinguished feel. At first glance the liners resembles an elastic sock – when you put it on and tight the laces, it enfolds perfectly to shape of your foot. There is not even a slight loose space, and what goes with it the fit is perfect. If I have to compare the feeling to any other liner I think only the Remz (freedom of feet design not OS!) skates come close. It’s worth to mention that originally the Spec Ops was planned to be released in only 3 sizes (S, M, L) due to the specific, stretchy material used that can adjust – yet the the idea was dropped. Eventually it comes with standard 8, 9, 10 etc size but still the difference between let’s say 8 or 9 is not so big. 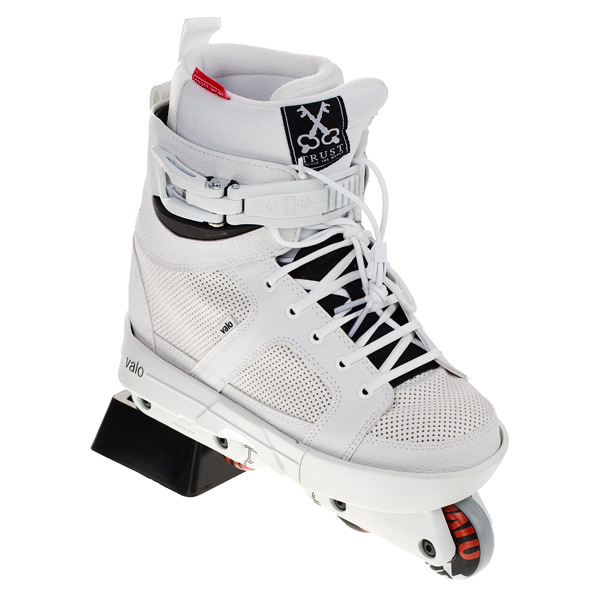 Everyone who have skated stock Valo liners could come across a problem with the liner tongue. Sometimes it was to thin (AB models) and ripped because of a buckle strap, other time they were to stiff (EB models)and caused some pain or it just constantly moved up and down. Spec Ops lacks of the tongue completely, the liner wraps around our feet preventing them from any movement inside – huge improvement! The interior material is another distinctive element. It’s really hard to explain by words but when we touch or push the liner interior it quickly concaves, however right after we put the finger off the same place gets convex. 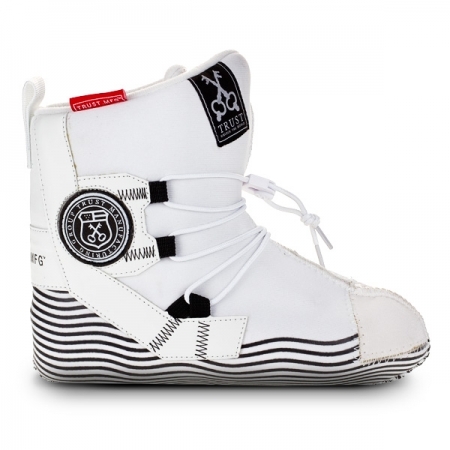 In other words the interior adjusts itself to your feet. After two months it still does it just like the first day out of the box so believe me it works! Let’s have a closer look at the outside of the liner. The most interesting part as well the most useful are the sticky lines on the whole length of the sole. If you have ever had Valo Light shell you know it’s super slippy and the liner usually moves inside. I always glued piece of velcro strap to the shell and liner to prevent it – now it’s completely unnecessary. The liner gets “blocked” and is way harder to put it out of the skate. The cuff bolt area is reinforced, and there is nice antishock insole added. It can be put inside the liner or under it directly into shell itself. It`s rather weird that the liner doesn’t have any vent system. When you tight up your skates well your foot is not „breathing” at all. Drying up the liners after every session can be annoying.. 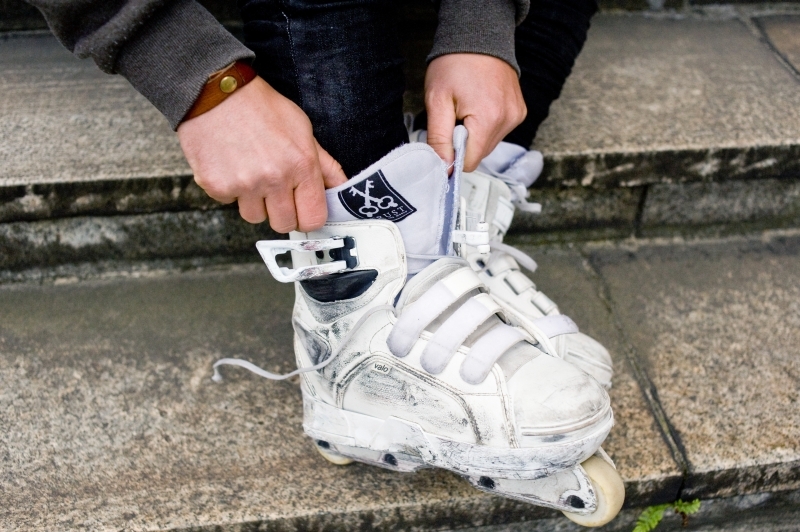 The liner has it’s own lacing system – obviously the solution has it’s ups, yet add to it the double lacing system in Valos (one for shell and other for skin) and it turns out that putting the skate on or off takes you 5 minutes – if you change spots often during a day let`s say by hooping into a car car it can be frustrating too..
As I mentioned before, the construction of the liner resembles more a sock rather than a standard liner – it doesn`t have a stiff, harder sole. I’m afraid that with time the sharp nuts from soulplates screws will start to rip of a liner from the bottom. Personally I put another much thinner antishock under the liner (in my case the one which is included is placed inside the liner). Finally we came to the biggest issue for all of us – the price. Over 90 Eur for a liner is quite a lot. The quality and great performance are there for sure yet for such price we can get even three pairs of stock liners which can also do the job. 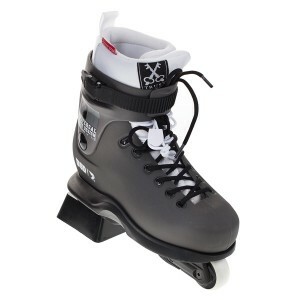 To sum up – if the price don’t scare you and you are looking for a perfect fitting liner the Trust Spec Ops will be your ultimate choice for Valo skates. Super light and completely preserving the specific feel of this skate. My previous experiences with Trust`s products (The Catalyst liner) proved that I don’t have to worry about the last – after 2 months the ankle area inside is still intact so I can honestly recommend Spec Ops to everyone! Below you can check a few clips of Krystian Zarzeczny, who helped me with this article. 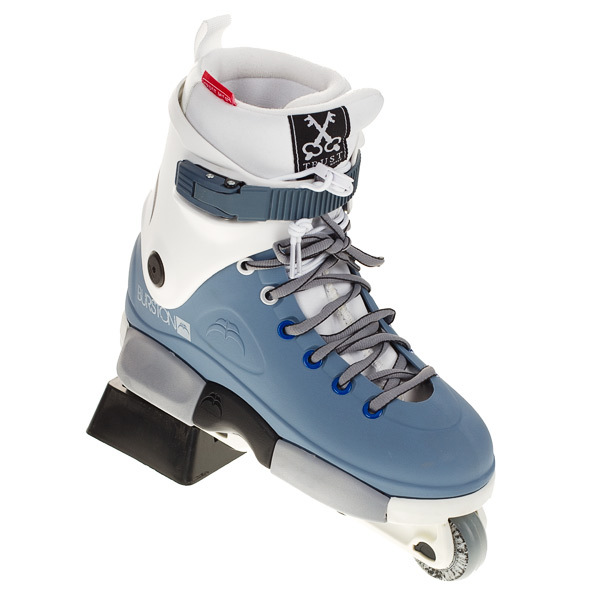 Krystian was using Trust Spec Ops in his Razors Genesys skate and he is not planning to change it anytime soon – find out for yourself why! This entry was posted in Hedonskate Review and tagged krystian zarzeczny, sebastian gruba, spec-ops, trust by Basza. Bookmark the permalink.